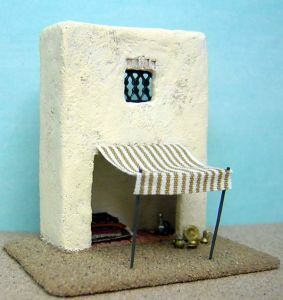 This little Middle Eastern shop is based on Pam Scott's 1:48 scale directions in Little Enough News, volume 8, issue 2, though I scaled it down to 1:144. The exterior and interior finish is achieved using the technique Pam developed for this project. The hanging lantern is Pam Scott's design too, from the same issue as the structure itself (another 1:48 design I scaled down). 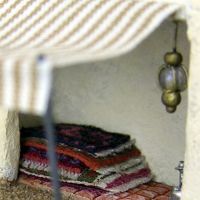 I knew that using my needlepointed rugs for this project would be a complete waste, as no details of the rugs would be visible in the dusky shop! 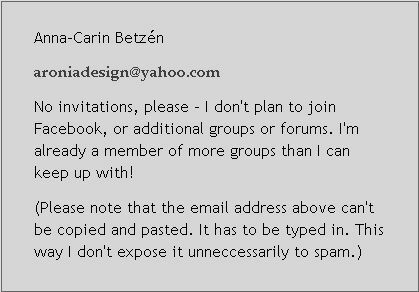 Instead, I painted simple designs on flocked fabric; just a border or a line of dots on most of them, and a simple afghan rug design for the top one (you could print a bunch of rugs on velour paper with a color printer for the same effect). Then I glued on fringe made from unraveled fabric before I glued them together in a stack. The hookah was really easy to make. An 11/0 bead (they're 2 mm in diameter), a bit of wire, some sewing thread, cyanoacrylate glue and Model Master's silver paint. As you can see in the closeup, I also added a tiny paper circle near the top for extra detail. The brass items are painted with brass paint from Model Master (also known as Italeri), their metallics are usually good. I made the dishes from copper foil or thin copper sheet. I placed the material on an upside-down mouse mat, put a circle template on top and ran a stylus round and round in one of the holes until it looked right. Then I cut it out with a revolving punch. The foil has to be rather sturdy or the stylus will go straight through it; the method might work on brass foil too if you could find one that is thin enough (brass is much harder than copper, so brass foil would need to be much thinner - else you won't be able to shape it at all). The pitcher is a section cut from a bumpy price tag holder (the ones that looks almost like a string of beads) with a wire handle added, and the bowl is just a metal bead.